If your enthusiasm is for your new project, work on it. If your enthusiasm is on a break, because you have the flu, go to bed. If your enthusiasm is for a non-work craft project, indulge. Last week, I was seized by the desire to (finally) write about reading 100 books. It was just this huge urge as I was getting ready for bed: Let's talk about reading! It wasn't at all what I had planned, but I did it. And your response has been lovely, I've never had so many fun conversations about books in my life! This same thing happened to me last year, when I fell into (obsessing about) quilting. Instead of sitting down and starting to write, I opened up my design wall on Fabric.com and started moving stuff around. I pinterest-ed pictures of quilts until my brain bubbled. My to-do list wants me to give up on the quilting stuff, and go back to work. But I resisted the to-dos and you know what? I got everything done! I had the biggest Starship registration ever and created the huge + helpful Captain's Log (only available in the Starship). It seems counter-intuitive, right? If you only have X hours to work, how can spending a chunk of them doing fun stuff leave you with enough time to get the “real” work done? I have a theory: in your creative business, the “fun stuff” is the “real work”. Because your real work is to create something to share with the world. Your real work is to communicate truly and from your most you-like place. Your real work is to connect with others through what you create. The only way you get to be good at the “real work” is to show up for it, to be awake for it, to listen and learn and apply and explore new areas of your business. And enthusiasm is the tool that wakes you up, that propels you forward, that sparks the curiosity that drives you to say “what about if I tried this?”. Enthusiasm is the thing that gets you through that awful middle part when you don't know what you're doing. And enthusiasm is contagious. Enthusiasm for quilting, leads to enthusiasm for my fellow creatives, which brings me back to enthusiasm for my current project. When I clamp down a new idea, and don't let it bubble around and capture me, I lose enthusiasm for everything. 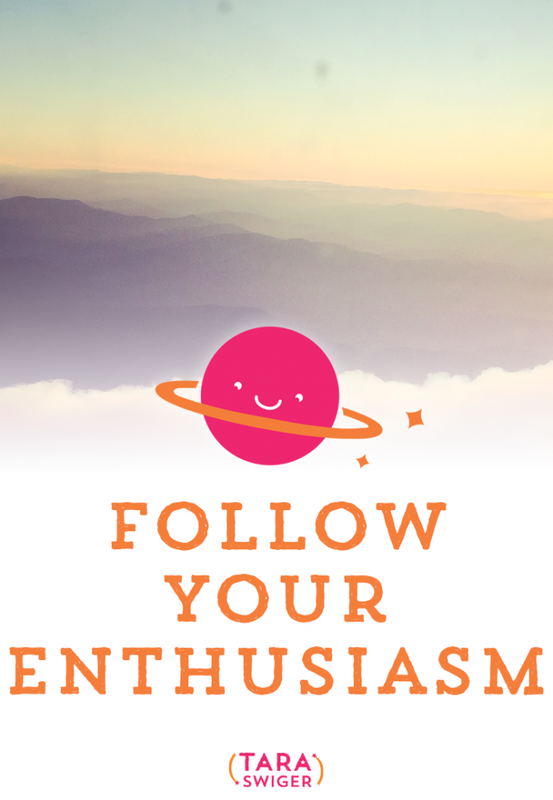 Identify what you're enthusiastic about, in this very moment. If you're totally swamped, this can be hard to do because everything is just so overwhelming. Instead of thinking about it as enthusiasm, look at your momentum. What comes easily? What do you get so absorbed in that you lose track of time? Enthusiasm isn't always jumping-up-and-down fun, sometimes it's just being really absorbed and feeling good about what you're working on. Write everything down. From gift ideas to cookie recipes, to what you want to do with your business, write every last thing down. You don't always have a choice on what you need to work on next. Bring your momentum to every project, by bringing in elements from your most enthusiastic project. This might be a playlist of music, working with the twinkle lights twinkling, or putting a stack of fabric on your writing desk. Take enthusiasm breaks. Spend 5 minutes working on your most exciting projects every hour. From googling an answer to pinning some inspiration, to writing a list of what you want to do next, to ordering that book you want to read, keep your interest alive. Give in. Do what you're excited about right now. Just about anything can wait for one day (or 2 or 3 hours) while you pursue what you're excited about. Instead of waiting to “reward” yourself for doing the hard stuff, start with the fun stuff! It'll cheer you up, get your juices flowing and put you in a better mood for the less-than-fun-stuff. What are you enthusiastic about right now? What a great post. I really needed that at the moment. It’s so difficult to feel sometimes what I am enthusiastic about and instead I launch so many ideas that don’t amount to much. Ah, that’s the trick, Henriette! Balancing enthusiasm with follow-through. I think we’ve got to find a way to pursue what we’re enthusiastic about, even when, in this particular moment, we’re not feeling like working on it. Ya know?